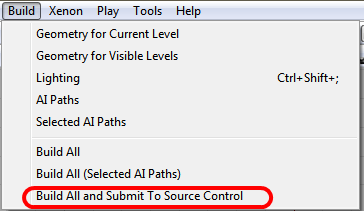 The editor now provides two methods in which to perform automated map builds which allow the user to build a map, have it save, and submit itself to source control all without the need for user interaction past the initial setup. This allows for builds to be completed overnight, etc. without the concern of a user keeping a binary file exclusively checked out longer than is necessary. Automated builds can be specified either by an in-editor dialog or via the command line. All automated builds always use production-level lighting, regardless of current editor setting. The editor dialog allows the user to kick off an automated build of the currently open map after providing a source control changelist description and choosing a few preferences. The user is required to enter a changelist description that will be used when the maps that are built and saved are submitted to source control. In addition to what the user provides as a description, a special "[Automatic Submission]" tag will be prefixed to the description when the maps are submitted. If checked, none of the built maps will be submitted to source control if any of them result in one or more mapcheck errors. If checked, none of the built maps will be submitted to source control if any of them fail to save for whatever reason. If checked, any of the built maps not already in the source control depot will be added automatically as part of the submission process. Once the user clicks "Build," the dialog will check that each map file is valid for building and if so, begin the process of a total build with production-level lighting. The preparation process checks to make sure that all of the maps already have files associated with them (i.e. none of them are "new" maps) and that each map is capable of being checked out of source control, or if not already in the source control depot, that the file is not read-only. In the event of a preparation error, the user will be immediately prompted on whether or not the build should proceed. As an example, suppose a user is attempting to build a map with three sub-levels but another user has one of the sub-levels exclusively checked out. The dialog will warn that the particular file cannot be checked out from source control. From that point, the user can opt to proceed with or cancel the build. If the user proceeds, the build will still factor in all of the levels, but the level that couldn't be checked out will not be saved or submitted to source control. Keep in mind that continuing in this manner will result in a partially built map being submitted to source control. Once a build completes successfully, the dialog will save all of the relevant files and submit all of the files that it is capable of to the source control depot. Automated builds can also be kicked off via command line arguments to the editor. Doing so will launch the editor, build the specified map, save it, submit it to source control, and then exit the editor upon completion. Command line builds are similar to those initiated by the editor dialog with the exception of their default behavior. In error cases where the dialog might prompt the user on whether to proceed or not, the command line build will just fail and abort the build unless specifically told to ignore such errors (see: Optional Command Line Arguments). This is the special parameter required to signal to the editor that an automated build has been requested. Note the usage of a quoted string to allow for spaces within the changelist description. If this parameter is omitted, the build will immediately fail during build preparation. 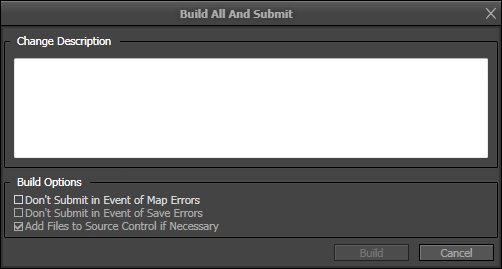 Description: Specifies whether mapcheck errors generated by building the maps should prevent submission or not. If set to FALSE, if any of the maps generate a mapcheck error, none of them will be submitted. Default Behavior: Ignored; Build errors are ignored by default as they are usually not serious enough to prevent a submission. Description: Specifies whether errors resulting from being unable to check out a map file (potentially checked out by someone else) should prevent submission or not. If set to FALSE, if any of the maps can't be checked out or written to for any reason, none of them will be submitted. Default Behavior: Build Abortion; Source control errors usually result in partial builds, so they default to aborting the build by default. Description: Specifies whether being unable to properly save a map file should prevent submission or not. If set to FALSE, if any of the maps can't be saved correctly for some reason, none of them will be submitted. Default Behavior: Build Abortion; Save errors usually indicate something has gone quite wrong, so they default to aborting the build process. Description: Specifies whether map files that aren't already in the source control depot should be added to the depot as part of the automated build. Default Behavior: FALSE; By default, map files not already in the depot are not added to the depot by the automated build.